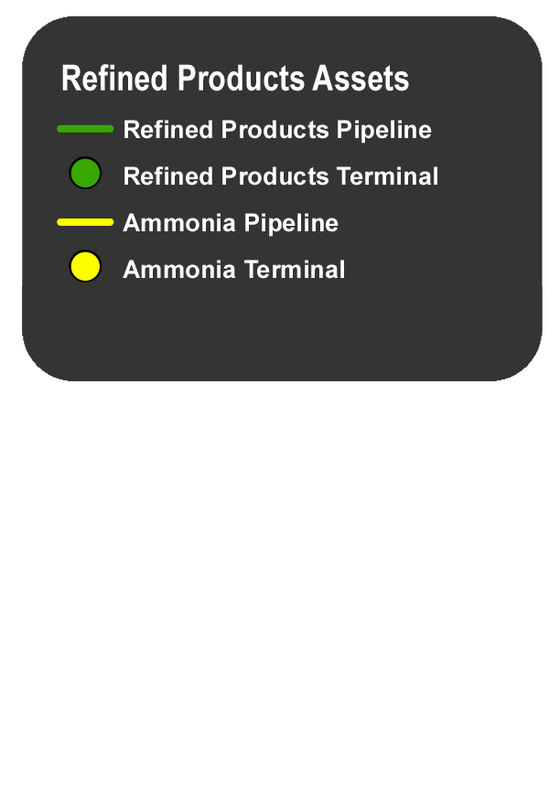 Our refined products segment consists of our common carrier refined products pipeline system, independent terminals and our ammonia pipeline system. Magellan is the longest common carrier pipeline system for refined products and LPGs in the United States, extending approximately 9,700 miles from the Texas Gulf Coast and covering a 15-state area across the central U.S. The system includes 45 million barrels of aggregate useable storage capacity at 53 connected terminals. Our network of independent terminals includes 25 refined products terminals with 6 million barrels of storage located primarily in the southeastern U.S. and connected to third-party common carrier interstate pipelines, including the Colonial and Plantation pipelines. Our 1,100-mile common carrier ammonia pipeline system extends from production facilities in Texas and Oklahoma to terminals in agricultural demand centers in the Midwest.